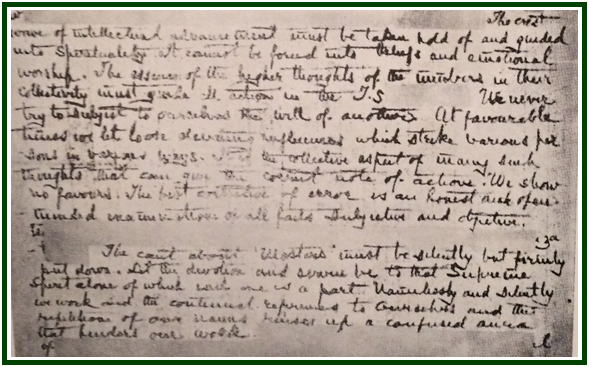 Photo of part of the 1900 Letter, with decisive words hidden from view. Letters”, TPH, India, 1973. The full text of the letter was first published in 1987. The document reproduced below is the complete text of the 1900 letter from a Master, to Annie Besant. It was published for the first time in “The Eclectic Theosophist”, number 101, September-October 1987, p. 1. Up to 1987, only the partial version of the letter was known, as it had been published by C. Jinarajadasa in “Letters From the Masters of the Wisdom” (TPH, letter 46 of the first series). There seems to be strong political reasons for that. On one hand, it does not seem politically profitable for the leaders of the Adyar Society to admit that since 1900 their Society has done exactly the opposite of what the Letter recommends. The text shows in a frank and direct language that the esoteric section of the Adyar Society was already out of line and out of focus since earlier than 1900. It is easy to see that it has remained so up to now. On the other hand, some students of William Q. Judge have their own reasons to question the authenticity of the letter. They correctly point out that by 1900 Annie Besant should not be a disciple of the Masters any longer. She had broken her solemn vows by publishing for the wide public, as part of her illegitimate version of “The Secret Doctrine”, the Esoteric School Papers which she had recently made a sacred promise to keep private and never to divulge. She had also forced Mr. William Q. Judge (one of the three main founders of the movement in 1875) out from the Adyar Society. And, unfortunately, even that was not all. Mrs. Besant belonged to the “inner group” of Mr. Alfred P. Sinnett, who made mesmeric and mediumistic sessions with false Adepts, in London. For these students of William Judge, therefore, if Annie Besant was no disciple any longer by 1900, the Masters could not communicate with her in any form. As a conclusion, they say that the letter must be a forgery made by someone in the Adyar Society who was against Annie Besant. So, for different reasons, both Adyar students and some Judge students tend to completely ignore the 1900 letter – or to give it scarce attention. Yet the fact remains that this letter anticipates, one by one, most of the many mistakes and absurdities which would be done by the Adyar leaders in the following decades, including the creation of an “esoteric popery” and the cessation of any criticisms against conventional dogmatic religions. Such criticism was part of the original programme of the theosophical movement created by H.P. Blavatsky. Another factor to be considered in the equation is that the ways and methods of the Masters are often difficult to predict or ascertain, as H.P.B. herself warned. They are at liberty to keep in contact with non-disciples and ex-disciples. On the other hand, Masters often do not give instructions to their true disciples, so that these students may develop their own independent vision of things. In the book “Mahatma Letters”, one can see examples of the fact that Masters may keep some contact with an ex-disciple after he or she completely “failed” – and this, for several karmic reasons. An extra hint as to the authenticity of the 1900 letter is that it was sent in the exact year and month when the Aquarius Age started, possibly being a “last farewell” to be understood only from a historical perspective. For some reason this letter was never destroyed, and came to be widely known only during the “general effort” of the following end-of-century, in 1987. The letter gives precious guidance to the theosophical work, and it is hoped that in due time it will receive proper attention by students worldwide. The text of the letter speaks for itself as to its value. The complete document is below. All the words and sentences which were omitted by C. Jinarajadasa are here included in CAPITAL LETTERS. A psychic and a pranayamist who has got confused by the vagaries of the members. The T.S. and its members are slowly manufacturing a creed. Says a Thibetan proverb “credulity breeds credulity and ends in hypocrisy.” How few are they who can know anything about us. Are we to be propitiated and made idols of. IS THE WORSHIP OF A NEW TRINITY MADE UP OF THE BLESSED M., UPASIKA AND YOURSELF TO TAKE THE PLACE OF EXPLODED CREEDS. WE ASK NOT FOR THE WORSHIP OF OURSELVES. THE DISCIPLE SHOULD IN NO WAY BE FETTERED. BEWARE OF AN ESOTERIC POPERY. The intense desire to see Upasika reincarnate at once has raised a misleading Mayavic ideation. Upasika has useful work to do on higher planes and cannot come again so soon. The T.S. must safely be ushered into the new century. YOU HAVE FOR SOME TIME BEEN UNDER DELUDING INFLUENCES. SHUN PRIDE, VANITY AND LOVE OF POWER. BE NOT GUIDED BY EMOTION BUT LEARN TO STAND ALONE. BE ACCURATE AND CRITICAL RATHER THAN CREDULOUS. THE MISTAKES OF THE PAST IN THE OLD RELIGIONS MUST NOT BE GLOSSED OVER WITH IMAGINARY EXPLANATIONS. THE E.S.T. MUST BE REFORMED SO AS TO BE AS UNSECTARIAN AND CREEDLESS AS THE T.S. THE RULES MUST BE FEW AND SIMPLE AND ACCEPTABLE TO ALL. No one has the right to claim authority over a pupil or his conscience. Ask him not what he believes. ALL WHO ARE SINCERE AND PURE MINDED MUST HAVE ADMITTANCE. The crest wave of intellectual advancement must be taken hold of and guided into spirituality. It cannot be forced into beliefs and emotional worship. The essence of the higher thoughts of the members in their collectivity must guide all action in the T.S. AND E.S. We never try to subject to ourselves the will of another. At favourable times we let loose elevating influences which strike various persons in various ways. It is the collective aspect of many such thoughts that can give the correct note of action. We show no favours. The best corrective of error is an honest and open-minded examination of all facts subjective and objective. MISLEADING SECRECY HAS GIVEN THE DEATH BLOW TO NUMEROUS ORGANIZATIONS. The cant about “Masters” must be silently but firmly put down. Let the devotion and service be to that Supreme Spirit alone of which each  one is a part. Namelessly and silently we work and the continual references to ourselves and the repetition of our names raises up a confused aura that hinders our work. YOU WILL HAVE TO LEAVE A GOOD DEAL OF YOUR EMOTIONS AND CREDULITY BEFORE YOU BECOME A SAFE GUIDE AMONG THE INFLUENCES THAT WILL COMMENCE TO WORK IN THE NEW CYCLE. The T.S. was meant to be the corner-stone of the future religions of humanity. To accomplish this object those who lead must leave aside their weak predilections for the forms and ceremonies of any particular creed and show themselves to be true Theosophists both in inner thoughts and outward observance. The greatest of your trials is yet to come. We watch over you but you must put forth all your strength. In “The Eclectic Theosophist” transcription of this letter, the word “each” is omitted but the original letter has this word. See the photofacsimiles of the actual letter on pp. 358-360 of the book “The Mahatmas and Their Letters”, by Geoffrey A. Barborka, TPH, Adyar, 1973, 422 pages. The full text of the above document was also published in the “Theosophical History” magazine, London, October 1987, see pp. 115-117.